I was thinking that instead of using a lathe to cut a mirror, we can simply laser cut or machine the proper conic sections directly out of a suitable material such as acrylic which flexible mirrors are regularly made in. If you were to take a cross section of what you want, you would get a right, Isosceles triangle where the hypotenuse is the mirror, and the top is a flat arc and the back is a curved rectangle. 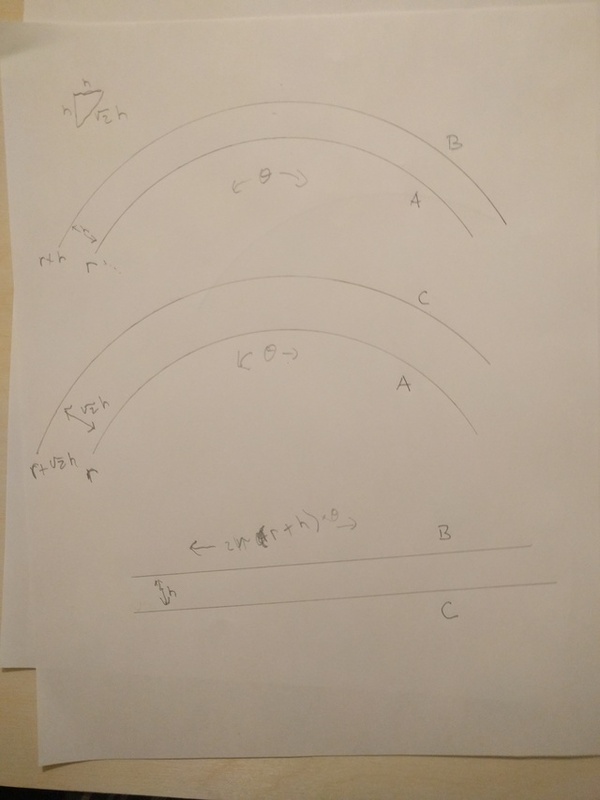 If we assume we want the height of the mirror to be ‘h’ and the inner radius ‘r’ then the mirror will be made of an arc of radius ‘r’ and ‘r + sqrt(2)*h’, the top will be of an arc of radius ‘r’ and ‘r + h’ and the back will be a strip of height ‘h’ and the same length as the perimeter of the outer radius of the top piece. In this diagram the top piece is first, the mirror is second, and the back is third. A nice thing about this is it is easily made with a variety of materials with limited tooling. The top piece does not need to flex at all so can be metal and act as an anchor, the back just needs to bend in one dimension, and the mirror could be something like commercially available aluminumized acrylic, or polished sheet metal. The only cuts needed are circles and lines so it can be cut with minimal tooling and even by a steady hand with a compass and ruler. Often you can flip plexiglass mirrors around and strip the protective paint off the aluminum turning them into first surface mirrors. 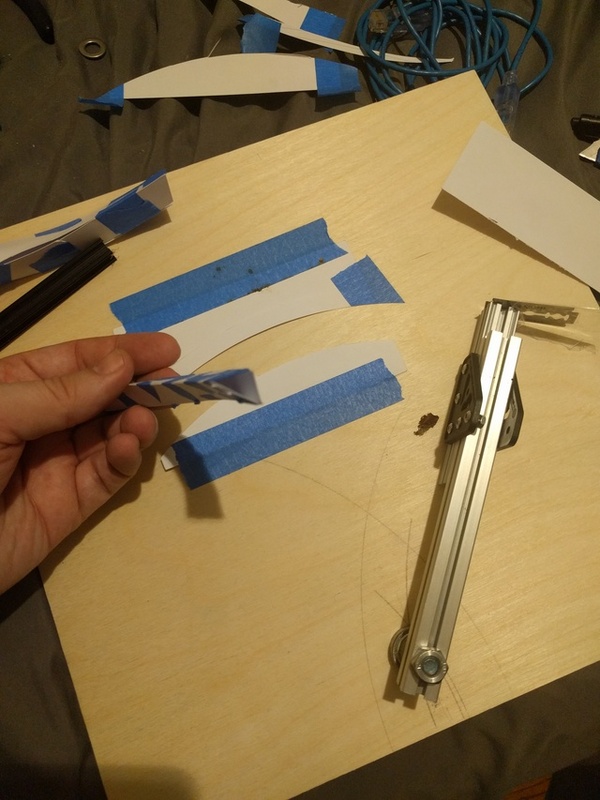 Unfortunately and ironically, I blew out my laser cutter diode attempting to use it in my prototype ldgraphy, so I wasn’t able to make nice lasercut models to demonstrate. However as a proof of concept I made a couple paper and cardstock models that are pretty darn ugly, but ended up in the right shape. 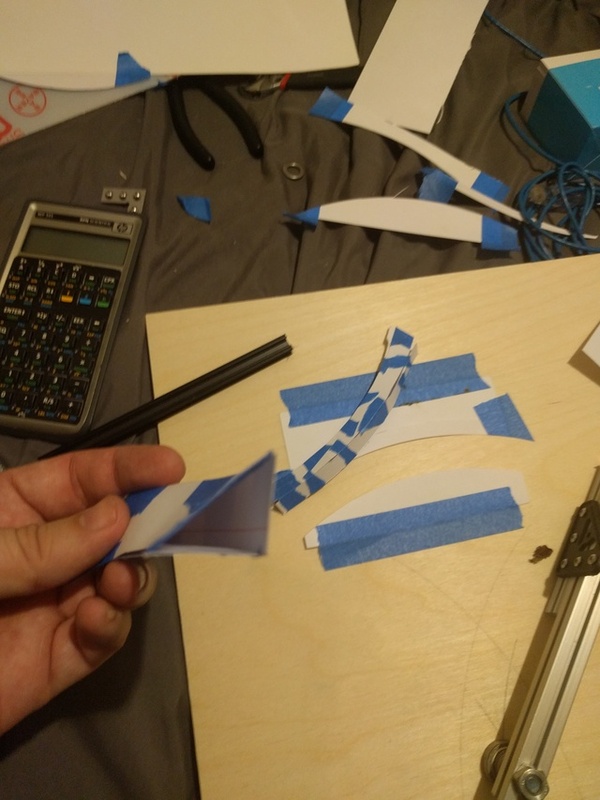 The tape wasn’t a very precise way to connect them and fought the curvature. Here are some pictures along with my extremely dangerous ad hoc circular cutting jig. Ideally, a real one would be laser cut or 3d printed onto glass for a smooth surface with interlocking fingers to ensure a consistent mating of surfaces, tape was not cutting it as precise enough to keep things square. « DSO Shell – A neat little kit scope.